The Athens International Airport at Spata is the gateway airport for most of Greece. If you're flying to or around Greece, chances are you will be going through Athens airport at one point or another. Athens International Airport is often abbreviated as AIA but the actual airport code is ATH. Use ATH if you are searching for flights online into or out of Athens. If you are arriving at the Athens airport to then spend time in Athens, you know the drill--retrieve your luggage at the baggage claim and then exit to find ground transportation. However, if you are making a connection to somewhere else in Greece, you have to be alert to the signs guiding you to domestic departures. Otherwise, you'll be swept along with the crowd to the street to connect with various transportation options. If you have luggage, you'll need to go to the baggage area, get your bags, and then retrace your steps to get into the right area of the airport for your connecting flight. If you are traveling from the United States, or any non-EU nation, you may erroneously be directed to "E.U." lines for entry. Most travelers in Greece are from the E.U., so this is a natural mistake, though it may cause some confusion. You want to be sure you enter the "non-EU" line. And if you're from the United States, you are not from a "Schengen" nation, so make sure you avoid that line option as well. Whether it is the unique symbols used for elevators, having the correct change for a luggage cart, or knowing in advance the airport's restroom situation, being prepared when you land at Athens airport can relieve some of the stress with traveling overseas. Some travelers have reported being confused by the elevator signs at the Athens International Airport. One symbol (which is not next to the elevator) is an inverted box with an image of a man and a woman, with arrows over their heads. To add to the confusion, this symbol is not repeated in the area actually holding the elevators, and the elevators are not visible from the doors. The symbol at the elevator is showing a piece of luggage on a cart. If you decide to take the escalator, don't worry that it is out of order--that escalator standing still will start up as you approach; it's somewhat disconcerting, yet energy-saving! If you have several pieces of luggage, you will probably want to use a luggage cart. But be aware the luggage cart dispenser takes only Euros. If you haven't exchanged a small amount of money ahead of time--which is recommended--there are machines nearby which will convert various currencies into Euros. It's also important to note that the luggage cart won't move unless you press down firmly on the handle. Also, for a huge, modern airport, toilets are in curiously short supply. If you hate using airplane toilets, this is one time you may want to make an exception before you land as there are very few restrooms where you deplane and at the baggage claim. They are also scarce in the Athens International Airport shopping area and at the gates for departing flights. If you have a layover between flights or are waiting for your flight to depart, there is plenty to do at the Athens airport. The departure lounge shopping area is beautiful, with a wide variety of Greek goods, newsstands, pharmacies, and specialty food shops, in addition to clothing stores and food-court type restaurants. The sole enclosed sit-down restaurant is located upstairs, next to the McDonald's, and is usually empty. There are often coupon booklets being handed out with a discount coupon for the food court, which will save you a few Euros. In the shops, keep an eye open for the extensive wine collection, including the ancient Greek retsina. Just remember the bottles will need to be placed in checked luggage. In the arrivals lounge, the Greek National Tourist Organization booth is also worth a stop to pick up free maps and travel brochures in several languages. The city of Athens operates a similar booth during the high season, staffed with friendly and helpful local Greeks. Believe it or not, there is actually a museum in the Athens airport. It may not take you long to go through, but is an interesting way to use up some otherwise dead time. There are also some nice museum pieces displayed just outside the airport terminal doors. If your travel itinerary requires you to find lodging near the airport, there are hotel options in close proximity. The Sofitel Airport Hotel is actually ​at the airport and therefore offers extremely easy access by foot. Requiring a short drive (which is often free shuttle service from the hotel), are the Holiday Inn, Peri's Hotel and Apartments, and Armonia Hotel. 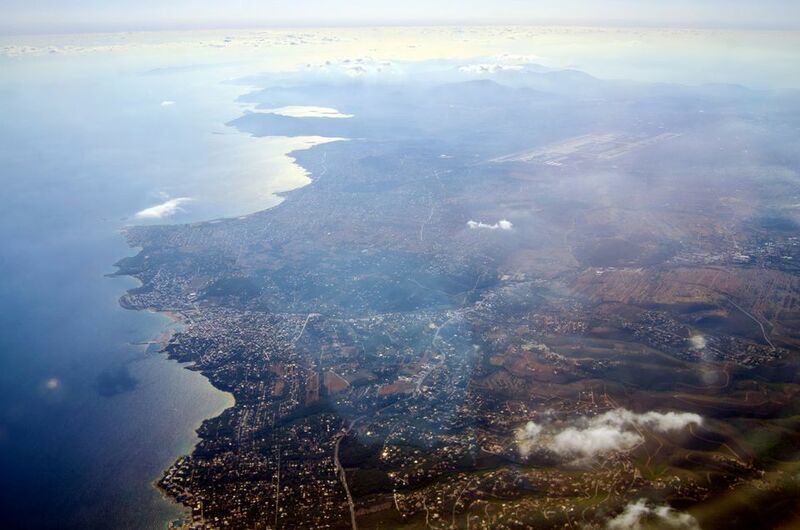 One problem facing travelers is that hotel facilities in the airport area are limited, and the next closest full-service hotels are about a half an hour away at Vouliagmeni. Savvy travelers are also taking advantage of the hotels at nearby Brauron (Vravrona), a pretty area boasting an excellent temple of Artemis, wineries, and spas. Stuck with a layover that is too short to warrant a hotel, but too long to go without sleep? You may be in luck--sort of. There are some hidden locations that are ideal for sleeping at the Athens International Airport. Once you've retrieved your luggage and gone through customs it's time to leave the airport. But what is the best mode of transportation? The suburban railway directly serves the airport, and Metro Line 3 also goes to and from the airport. It may sound convenient, but be aware that the Metro does not operate from the airport between approximately 11 p.m. and 6 a.m. It can also be challenging if you are traveling with a lot of luggage, as it is difficult to manage on the suburban railway since many stations have lots of steps, and elevators are not always accessible. Many bags may also be difficult to maneuver on the regular buses, but if you are a light packer you may want to check out the Athens Airport Bus Service. You can also get a limo to or from the airport; for groups of four or more, this may actually save money or simply be worth the comfort. The Athens International Airport at Spata is also known as the Eleftherios Venizelos Airport. It also is sometimes just called Spata or Spada. The airport code is ATH.